"Clean Uninstall" cleans fingerprints (such as preferences) left by an add-on from your Firefox profile upon its removal. Usually add-on developers do not clear preferences created by their extension just before extension gets uninstalled. This leads to have a massive pref.js file once you have tried a few extensions. So after trying out a few extensions, although you have removed them, but your Firefox is not as responsive as it used to be. This extension notifies you about these preferences after an extension got removed. What is Clean Uninstall extension and how does it work? 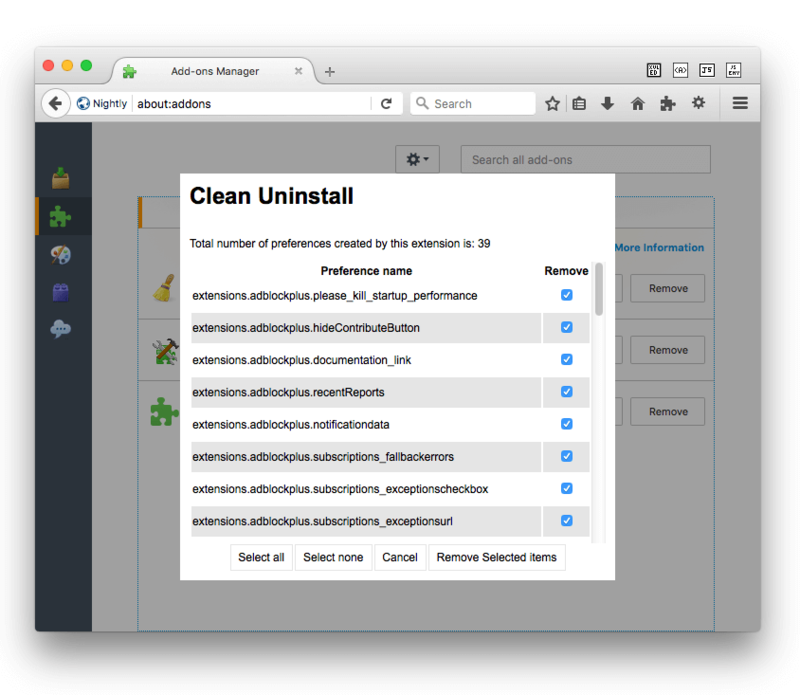 Clean Uninstall is a simple way to clear all the messup addons leave behind when they get uninstalled. You can think of Clean Uninstall as a CCleaner for your Firefox Browser. Basically the extension looks inside the pref.js and finds all the preferences that are generated by the extension you just have uninstalled. If any preference is found, then a window opens up to notify you of the preferences that are not necessary anymore. You can select those preferences and ask Clean Uninstall to remove them. Clean Uninstall extension doesn't seem to work fine on my Firefox. How can I confirm this and open a useful bug report? First make sure you have the latest version of the extension installed. If so and still Clean Uninstall is not functioning, try to install it on a clean profile just to make sure there is no compatibility issues with your current extension set. Follow the instructions in this blog post to create a new temporary profile just to try the Clean Uninstall extension. If the extension is not working even in a clean profile, then open Error Console (Ctrl + Shift + J). Clear the console and disable and re-enable the extension and see if you get a new error message in the console. If you got one, you can post it in the comment section of this page. This way I can find and fix the bug. If the extension works as expected in the new profile, switch back to the original profile and try the console monitoring once more. Hopefully we can find what is causing the extension from initiating. I have just installed Clean Uninstall but I am not sure how to use it. There is no UI element at all. How can I access the extension? Clean Uninstall does not add any UI element to your Firefox browser. To see how the extension works, head to about:addons page and uninstall an unnecessary extension. If any preference associated to the removed extension is found, a window opens up notifying you about those preferences. You can decide whether you want Clean Uninstall to remove these preferences or not. When an extension is uninstalled, Firefox still allows me to undo this action. What is going to happen to the extension's preferences? Clean Uninstall will restore all the deleted preferences and will notify you about the number of preferences that have been restored. So normally the extension should work just fine like you have never removed it. Why Clean Uninstall cannot find preferences of some of my extensions? Well, there are two types of extensions in Firefox. Classic and bootstrapped. In the former case, the developer chooses the name of the preference branch. There is no way for Clean Uninstall to guess this name easily. For now Clean Uninstall tries extension id, name, and a few more combinations of the name to detect all the preferences created by the extension. Still if you have found an extension which Clean Uninstall cannot find the branch name, please file a bug in the GitHub to append the extension to the map list. Is it possible to clean old preferences left by old installed add-ons with Clean Uninstall? From version 0.1.2, there is a new button in the options page. Pressing this button opens a new windw which contains all the preference branches that are loaded by pref.js. Clean Uninstall tries to find the add-on's title for each branch name. There are three different possibilities: 1) "a removed add-on": In this case, the branch belongs to an old bootstrapped add-on and it is safe to remove the branch, hence the remove checkbox is already checked for you. 2) "unknown add-on": In this case, the branch is populated by an add-on which Clean Uninstall was unable to detect the name (the add-on belongs to the traditional add-on category). Usually it is possible to guess the name of the add-on by looking at the branch title. Be careful if you want to remove the branch as this action cannot be undone. 3) Add-on's title is displayed: In this case, if the add-on is listed in your add-on's list, obviously Clean Uninstall does not allow the branch removal. To remove the branch you need to first remove the add-on from add-on manager. How can I see the list of all installed add-ons in Firefox browser? Click on the Firefox button -> Open Help Menu -> Troubleshooting Information. You can see the list of all installed add-ons under "Extensions" section. Why Clean Uninstall offers preferences removal when I disable an extension? When you uninstall a bootstrapped add-on, Firefox does not actually uninstall it but disables it. When the add-on manager is closed the actual uninstallation occurs. There is no way for Clean Uninstall to detect whether an extension is deliberately disabled or it is a pending action just before the actual uninstallation. Hence the panel is offered on both uninstall and disable events.